Be a better decision maker and incident commander at structure fires! This all new book provides strategy and tactics for the incident commander arriving at structure fire incidents using the available responding resources. Learn to assess the fire situation, initiate a command structure, and deploy resources until the transfer of command or termination of the incident. The NEW fire dynamics content includes the latest research on fire behavior from UL and NIST with all new photographs and drawings that illustrate these new fire science concepts. Read and see the new science so that you can apply it to structure fires. Strategies and tactics from national experts are presented and applied to hypothetical structure fire scenarios throughout the book. The target audience is all career and volunteer personnel who respond to single and multifamily dwellings incidents, commercial occupancies, and unique target or special hazards events. 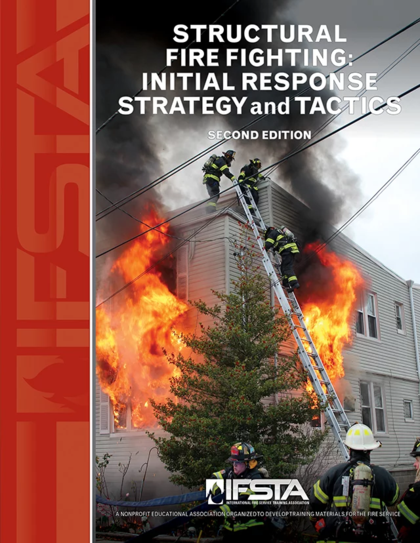 The manual meets the requirements of the FESHE course outcomes for the Associates level course, “Strategies and Tactics.” This manual also broadens the knowledge of the strategy and tactics JPR’s in NFPA®1021, Standard for Fire Officer Professional Qualifications. The manual is the best choice for use in training agencies, college degree programs, and as a resource for firefighters and fire officers who serve as, or are training to be, incident commanders. Additional standards referenced in the manual include NFPA 920, 921, 400. Each of the last three (3) chapters include five (5) training scenarios that reflect real incidents that an incident commander will find when responding to a residential structure, a commercial structure fire and a structure fire with special hazards.